Street Styled has come to Paris! We jumped aboard the Eurostar from London to the city of style, and love, to find out what the men in Paris are wearing – and how they’re wearing it – this winter. Man For Himself headed out onto the beautiful streets of Paris to discover what the men are wearing this season. Thanks to the suggestions from our followers and local Parisians, we worked our way through the iconic sights, as well as some of the most trendy areas of the city. There is no denying that the men of Paris have style! Which look is your favourite? Let us know in the comments below! Gedimas is perfectly nailing his look. Pairing an oversized scarf looks great with his brown leather jacket, distressed jeans and Chelsea boots. Top-to-toe, high street, Gediminas shows that you don’t have to be buying designer to look premium! Quilted coats are perfect in freezing temperatures! Joel’s is from Woolrich. The bright green adds a pop of colour to the rest of his trendy – but muted – outfit. He has mixed a vintage shirt from Australia; with a pair of jeans from Tokyo. It’s great to pick up pieces from your travels! When it comes to style, it’s not just about the clothes on your back and the shoes on your feet. It’s also about your grooming routine and the fragrance you wear. L’Artisan Parfumeur have become a firm favourite of Man For Himself . Established in 1976, the niche Parisian fragrance brand make some of the most gorgeous scents and candles page. We discovered their unique scents last year and ever since our first spray, we have had our eyes on testing out all of their fragrances. 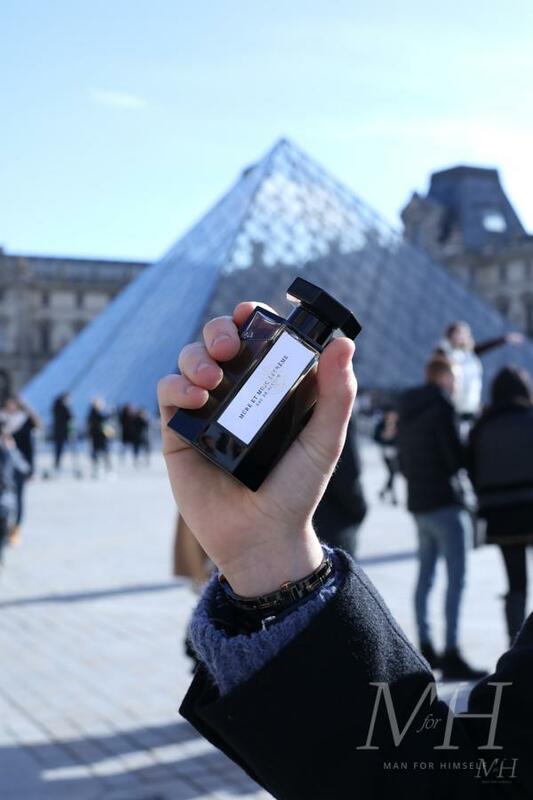 As a luxury Parisian brand, L’Artisan Parfumeur were the perfect partners for this episode of Street Styled. We really like the brown tones of Henri’s outfit. A camel coat is always a solid investment for this season; and it looks great over dark denim or chinos. Do like Henri and Layer up with a multi-toned scarf. This easy casual look, worn by this French singer, is great for everyday. A denim jacket is so versatile and the mustard jumper brings a splash of colour to his navy chinos. Finish the look with a pair of white trainers. This outfit really stood out on the streets of the Marais. French vet, Christophe, likes to add a touch of sportswear to his wardrobe and he mixes it in with this more formal overcoat. Layering a plain black hoodie underneath adds a modern twist. Accessorise with a cross over body bag, which were all over the catwalks last year. Ulysse is definitely bringing some style to Paris with his rolled up trousers and pulled up socks. The maroon sweatshirt adds some colour to his dark overcoat. We also loved the colour of his bleached hair and a touch of glitter on his cheekbones. Mickael clearly enjoys more high-end fashion designers, as he told us his favourite is Virgil Abloh (Artistic Director, Louis Vuitton menswear). Again, the quilted jacket (from Gucci) looks great with his distressed denim jeans. And you can’t go wrong with a pair of white trainers (from Dolce & Gabbana) worn with a black hoodie. Ladislas caught our eye, in the centre of Paris, with his vintage coat and bright blue roll neck jumper. It turned out, he has ‘borrowed’ this cashmere jumper from his Uncle! We think the contrast of the brown against blue brings a retro vibe and the wide lapel collar certainly adds some character. We love a classic Breton stripe and this one (from Petit Bateau), on this stylish man from Brittany, looks great with his Dad’s vintage shearling 70’s jacket. Definitely have a dig through your Dad’s/Grandad’s wardrobe to find a gem like this! Dressed for Street Styled in Paris, Robin wore an A.P.C. black overcoat; with a blue chunky knit roll neck; and a pair of on-trend wide leg denim trousers. The trainer-style boots were perfect for exploring the city streets and really stood out with a pop of neon orange. Where should we head for our next Street Styled? Let us know!